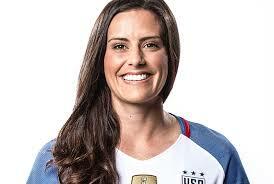 Ali Krieger is a world class right back who deserves much more credit. She was solid in defence for her club Orlando Pride last season and played every single minute. For some reason however she really isn't getting the recognition she deserves and is getting left out of the current USWNT roster selections. I honestly can't understand why Jill would rather play players out of position rather than give Ali the call ups she deserves. Especially as she is only 2 caps short of 100. She has also bounced back from so many injuries over the years but is still a player of great standard she is a true inspiration to someone struggling through a current injury. 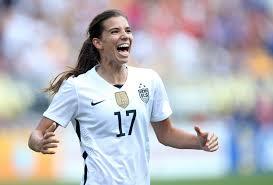 Tobin Heath is a brilliant midfielder. She plays in the same position as me and is one of the reasons I continue to play. She is a player I have looked up to for a very long time and think I always will. She has had to sit out of most of this year due to injury however she has bounced back and won the playoffs with the Thorns this season. Tobin is one of those players you get excited to watch due to her pure skill and talent. I am looking forward to watching her play for many years to come. Kelley O'Hara aka the squirrel, Kelley is a fantastic player and gives 100% in which ever position she plays whether it be defence, midfield or as a forward. She also scored a great goal against Germany in the 2015 world cup which I honestly believe won them the whole tournament. Kelley has recently achieved 100 caps and I can't wait to see her achieve so many more. 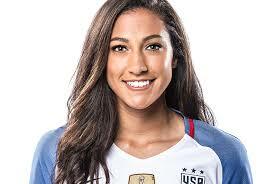 Christen Press is yet another underrated player within the USWNT. I don't understand why she doesn't get more starts within the squad she is a great player with fantastic attacking ability. She really does deserve more of a chance when it comes to international games. However at only 28 years old I honestly do believe she has a lot more game time and a lot more goals in her and hopefully she will win another world cup. 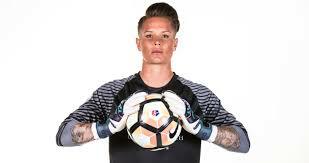 Now my favourite of them all Ashlyn Harris. Never gets enough game time for the USWNT but when she does she is absolutely amazing and her performances are always 100%. Ashlyn is great at reading the situation in front of goal and is great at commanding her back line. I really hope she gets the time she deserves soon as she can add so much more to the starting 11. Unfortunately she did suffer a quad injury earlier this year but since then she has bounced right back and is looking promising in all the games she plays once more. So there you have it those are my top 5 players currently playing for the USWNT. I can't wait to watch more of their games and even hopefully see them play over here in the UK one day. Do you have any favourite women's football players? Let me know in the comments below.